The collimator and object generator combination project a test target at a particular subtended angle depending on the focal length of the collimator. This subtended angle should meet one of two criteria. It could be small enough to be considered diffraction limited. Or it can be small enough so that the corresponding mathematical correction at the maximum spatial frequency of interest is considered negligible. The projected beam from the collimator should overfill the entrance pupil of the optical system under test. This means that the clear aperture of the collimator should be larger than the entrance pupil of the system under test. For example, a 28 mm-200 mm F/2.8 zoom camera lens will have a maximum entrance pupil diameter = 200 mm/2.8 or 71.4 mm. A 100 mm clear aperture collimator would be suitable for testing this lens. The collimator should be well corrected over the wavelength range of the optical system under test. For a refractive collimator this means that the optical design should be achromatic or apochromatic over the desired wavelength range. 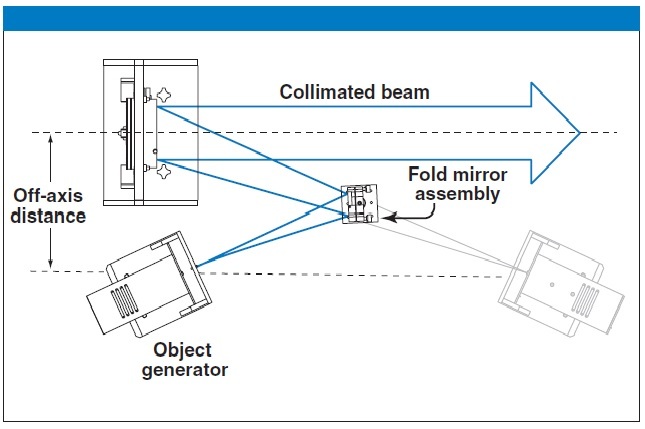 For testing systems used over a broad wavelength range of projection, a reflective collimator is usually more convenient. Reflective collimators are recommended for performing polychromatic measurements over extended wavelength ranges. Each collimator is an off-axis paraboloidal mirror (OAP) with /8 (633 nm) surface accuracy and an enhanced aluminum reflective coating. Other coatings can be supplied upon request. Each includes a kinematic mount, reference flat mirror, and optical path fold mirror assembly. The clear aperture, EFL, and off-axisdistance (OAD) determine the placement of the object generator on an optical table.These also determine the ability to fold the optical path without beam interference. A reflective collimator is an off-axis segment of a paraboloidal mirror. Optikos specifies the effective focal length (EFL) of its collimators using the true parabolic focal length. 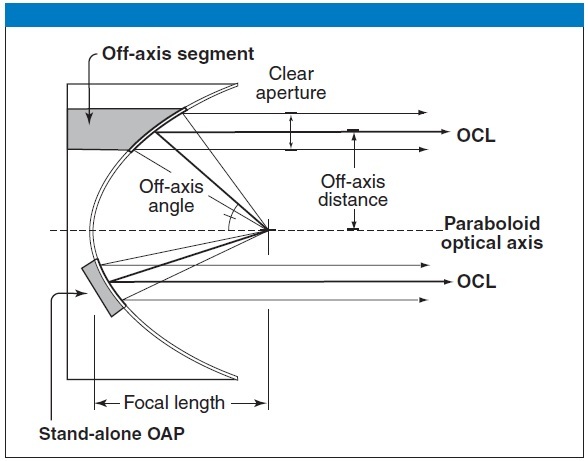 The segment is defined by the off-axis distance (OAD) and the clear aperture.The OAD locates the optical centerline (OCL) of the segment. Note: Collimators for OpTest® systems use the standard 500 mm (13 inch) optical axis height.